In a bowl with an electric mixer beat together butter, shortening, and 3/4 cup sugar until light and fluffy. With a knife halve vanilla beans lengthwise. Scrape seeds into butter mixture and beat in egg and vanilla extract until combined well. Sift flour, baking powder, and salt into mixture and beat until just combined. On a large sheet of wax paper form dough into a 10x2-inch log and roll up in wax paper. Chill dough until firm, at least 4 hours. Dough keeps up to 3 days wrapped in wax paper and foil. Preheat oven to 375°F (190 C). Put remaining 1/4 cup sugar on a platter. Remove wax paper and roll log in sugar (not all sugar will adhere to log). Cut log crosswise into 1/4-inch-thick slices and dip cut sides of slices in sugar on platter. 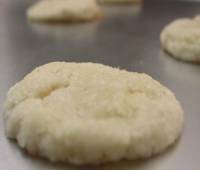 Arrange cookies 1/2 inch apart on ungreased baking sheets and bake in batches in middle of oven 10 to 12 minutes, or until edges are pale golden. With a metal spatula transfer cookies to a rack to cool. Cookies may be made 2 days ahead (see note, above) and kept between sheets of wax paper in an airtight container. i thought the the vanilla bean cookies were delicious. i would definitely recommend them.